Roman emperor, born at Italica, in Spain, on the 18th of September 53. The family to which he belonged was probably Italian and not Iberian by blood. His father began as a common legionary soldier, and fought his way up to the consulship and the governorship of Asia. The younger Trajan was rigorously trained by him, and imbued with the same principles and tastes. He was a soldier born and bred. No better representative of the true old hardy Roman type, little softened by either luxury or education, had come to the head of affairs since the days of Marius. His training was almost exclusively military, but his experience as an officer gave him an acquaintance with almost every important province of the empire, which was of priceless value to him when he came to the throne. For ten years he held a commission as military tribune, which took him to many lands far asunder; then he filled important posts in Syria and Spain. By the year 89 he had achieved a considerable military reputation. At that time L. Antonius Saturninus headed a rebellion in Germany, which threatened seriously to bring Domitian's rule to an end. Trajan was ordered in hot haste from Further Spain to the Rhine. Although he carried his troops over that long and arduous march with almost unexampled rapidity, he only arrived after the insurrection had been put down. But his promptitude raised him higher in the favor of Domitian, and he was advanced to the consulship in 91. Of the next five years of his life we know nothing definite. It is not unlikely that they were spent at Rome or in Italy in the fulfilment of some official duties. When the revolution of 96 came, and Nerva replaced the murdered Domitian, one of the most important posts in the empire, that of consular legate of Upper Germany, was conferred upon Trajan. An officer whose nature, as the event showed, was interpenetrated with the spirit of legality was a fitting servant of a revolution whose aim it was to substitute legality for personal caprice as the dominant principle of affairs. The short reign of Nerva really did start the empire on a new career, which lasted more than three-quarters of a century. But it also demonstrated how impossible it was for anyone to govern at all who had no claim, either personal or inherited, to the respect of the legions. Nerva saw that if he could not find an Augustus to control the army, the army would find another Domitian to trample the senate under foot. In his difficulties he took council with L. Licinius Sura, a lifelong friend of Trajan, and on the 27th of October in the year 97 he ascended the Capitol and proclaimed that he adopted Trajan as his son. The senate confirmed the choice and acknowledged the emperor's adopted son as his successor. After a little hesitation Trajan accepted the position, which was marked by the titles of imperator, Caesar and Germanicus, and by the tribunician authority. He immediately proceeded to Lower Germany, to assure himself of the fidelity of the troops in that province, and while at Cologne he received news of Nerva's death (January 25, 98). The authority of the new emperor was recognized at once all over the empire. The novel fact that a master of the Romans should have been born on Spanish soil seems to have passed with little remark, and this absence of notice is significant. Trajan's first care as emperor was to write to the senate an assurance like that which had been given by Nerva, that he would neither kill nor degrade any senator. He ordered the establishment of a temple and cult in honor of his adoptive father, but he did not come to Rome. In his dealings with the mutinous praetorians the strength of the new emperor's hand was shown at once. He ordered a portion of the force to Germany. They did not venture to disobey, and were distributed among the legions there. Those who remained at Rome were easily overawed and reformed. It is still more surprising that the soldiers should have quietly submitted to a reduction in the amount of the donative or gift which it was customary for them to receive from a new emperor, though the civil population of the capital were paid their largess (congiarium) in full. By politic management Trajan was able to represent the diminution as a sort of discount for immediate payment, while the civilians had to wait a considerable time before their full due was handed to them. The secret of Trajan's power lay in his close parsonal relations with the officers and men of the army and in the soldierly qualities which commanded their esteem. He possessed courage, justice and frankness. Having a good title to military distinction himself, he could afford, as the unwarlike emperors could not, to be generous to his officers. The common soldiers, on the other hand, were fascinated by his personal prowess and his camaraderie. His features were firm and clearly cut; his figure was tall and soldierly. His hair was already grey before he came to the throne, though he was not more than forty-five years old. When on service he used the mean fare of the common private, dining on salt pork, cheese and sour wine. Nothing pleased him better than to take part with the centurion or the soldier in fencing or other military exercise, and he would applaud any shrewd blow which fell upon his own helmet. He loved to display his acquaintance with the career of distinguished veterans, and to talk with them of their battles and their wounds. Probably he lost nothing of his popularity with the army by occasional indulgence in sensual pleasures. Yet every man felt and knew that no detail of military duty, however minute, escaped the emperor's eye, and that any relaxation of discipline would be punished rigorously, yet with unwavering justice. Trajan emphasized at once his personal control and the constitutionality of his sway by bearing on his campaigns the actual title of "proconsul", which no other emperor had done. All things considered, it is not surprising that he was able, without serious opposition from the army, entirely to remodel the military institutions of the empire, and to bring them into a shape from which there was comparatively little departure so long as the army lasted. In disciplinary matters no emperor since Caesar Augustus had been able to keep so strong a control over the troops. Pliny rightly praises Trajan as the lawgiver and the founder of discipline, and Vegetius classes Augustus, Trajan and Hadrian together as restorers of the morale of the army. The confidence which existed between Trajan and his army finds expression in some of the coins of his reign. For nearly two years after his election Trajan did not appear in Rome. He had decided already what the great task of his reign should be the establishment of security upon the dangerous northeastern frontier. Before visiting the capital he determined to put affairs in train for the attainment of this object. He made a thorough inspection of the great lines of defense between the Danube and the Rhine, and framed and partly carried out a vast scheme for strengthening and securing them. The policy of opposing uncivilized tribes by the construction of the limes, a raised embankment of earth or other material, intersected here and there by fortifications, was not his invention, but it owed in great measure its development to him. It is probable that the northernmost part of the great limes Germaniae, from the Rhine at Rheinbrohl, nearly midway between Coblenz and Bonn, to a point on the Main east of Frankfurt, where that river suddenly changes its course from north to west, was begun by Domitian. The extension of this great barrier southwards to the point at which it met the limes Raetiae was undertaken by Trajan, though we cannot say how far he carried the work, which was not entirely completed until long after his time. We may without hesitation follow the opinion of Theodor Mommsen, who maintains that the limes was not intended, like Hadrian's Wall between the Tyne and the Solway, and like the great wall of China, to oppose an absolute barrier against incursions from the outside. It was useful as marking definitely the boundary of the Roman sway, and as assuring the Romans that no inroad could be made without intelligence being had of it beforehand, while the limes itself and the system of roads behind it enabled troops to be directed rapidly to any threatened point, and the fortified positions could be held against large numbers until reinforcements arrived. Great importance was no doubt attached to the perfection of the lines of communication bearing on the limes. Among a people of roadmakers, Trajan was one of the greatest, and we have definite evidence from inscriptions that some of the military roads in this region were constructed by him. The more secure control which the Romans now maintained over the territory within the limes tended to its rapid civilization, and the Roman influence, if not the Roman arms, soon began to affect powerfully the regions beyond. After his careful survey of the Rhine end of the frontier defenses, Trajan proceeded to strengthen them in the direction of the Danube. From the age of Tiberius onwards the Romans possessed the whole southern bank of the river from its source to the Euxine. But the precarious tenure of their possession had been deeply impressed on them by the disasters and humiliations they had undergone in these districts during the reign of Domitian. A prince had arisen among the Dacians, Decebalus by name, worthy to be placed at the head of all the great barbarian antagonists of Rome. Like Maroboduus, he was able to combine the forces of tribes commonly hostile to each other, and his military ability almost went the length of genius. Domitian attacked him but was compelled to make an ignominious peace. He agreed to pay to Decebalus an annual subsidy, and to supply him with engineers and craftsmen skilled in all kinds of construction, but particularly in the erection of fortifications and defensive works. During the nine or ten years which had elapsed since the conclusion of this remarkable treaty the Dacian prince had immensely strengthened the approaches to his kingdom from the Roman side. He had also equipped and drilled his formidable army after the Roman fashion. It was impossible for a soldier like Trajan to endure the conditions accepted by Domitian; but the conquest of Dacia had become one of the most formidable tasks that had ever confronted the empire. Trajan no doubt planned a war before he left the Danube for Rome late in 99. The arrival of the emperor had been awaited in the capital with an impatience which is expressed by Pliny and by Martial. As he entered the city and went on foot to the Capitol the plaudits of the people were unmistakably genuine. During his stay in the city he riveted more firmly still the affections both of the senate and of the people. The reconciliation of the empire with liberty, inaugurated, as Tacitus says, by Nerva, seemed now to be securely achieved. Trajan was absolutely open and simple, and lived with men at Rome as he had lived with his soldiers while on service. He realized the senate's ideal of the citizen ruler. The assurance that no senator should suffer was renewed by oath. All the old republican formalities were most punctiliously observed -- even those attendant on the emperor's election to the consulate, so far as they did not involve a restoration of the old order of voting at the comitia. The veneration for republican tradition is curiously attested by the reproduction of many republican types of coin struck by senatorial officers. Trajan seized every opportunity for emphasizing his view that the princeps was merely the greatest of the magistrates, and so was not above but under the laws. He was determined, he said, to be to his subjects such a ruler as he had desired for himself when a subject. Real power and influence were accorded to the senate, which had now, by the incorporation of members whose origin was provincial, become in a manner representative of the whole empire. Trajan associated with the senators on equal terms, and enjoyed in their company every kind of recreation. All pomp was distasteful to him and discarded by him. There was practically no court, and no intrigues of any kind were possible. The approach to his house was free, and he loved to pass through the city unattended and to pay unexpected visits to his friends. He thirsted for no senator's blood, and used severity against the delatores alone. There was but one insignificant conspiracy against him during his whole reign. Though not literary himself, Trajan conciliated the literary men, who at all times had close relations with the senate. His intimate, M. Licinius, played an excellent Maecenas to his Augustus. In his efforts to win the affections of Roman society Trajan was aided by his wife Plotina, who was as simple as her husband, benevolent, pure in character, and entirely unambitious. The hold which Trajan acquired over the people was no less firm than that which he maintained upon the army and the senate. His largesses, his distributions of food, his public works, and his spectacles were all on a generous scale. The exhibitions in the arena were perhaps at their zenith during his tenure of power. Though, for some unexplained reason, he abolished the mimes, so beloved of the populace, at the outset of his reign, he availed himself of the occasion of his first triumph to restore them again. The people were delighted by the removal of the imperial exedra (a large chamber with open front) in the circus, whereby five thousand additional places were provided. Taxation was in many directions reduced, and the financial exactions of the imperial officers controlled by the erection of a special court. Elaborate precautions were taken to save Italy from famine; it is said that corn for seven years' consumption at the capital was retained in the granaries. Special encouragement was given to merchants to import articles of food. The corporation of bakers was organized and made more effective for the service of the public. The internal trade of Italy was powerfully stimulated by the careful maintenance and extension of the different lines of road. But the most striking evidence of Trajan's solicitude for his people's welfare is found in his institution of the alimenta, whereby means were provided for the rearing of poor and orphan children in Italy. The method had been sketched out by Nerva, but its great development was due to Trajan. The moneys allotted by the emperor were in many cases supplemented by private benevolence. As a soldier, Trajan realized the need of men for the maintenance of the empire against the outer barbarians, and he preferred that these men should be of Italian birth. He was only carrying a step farther the policy of Augustus, who by a system of rewards and penalties had tried to encourage marriage and the nurture of children. The actual effect of Trajan's regulations is hard to measure; they were probably more effectual for their object than those of Augustus. The foundations were confiscated by Pertinax, after they had existed less than a century. On the 1st of September in the year 100, when Trajan was consul for the third time, Pliny, who had been designated consul for a part of the year, was appointed to deliver the "Panegyric" which has come down to us, and forms a most important source of our knowledge concerning this emperor. Pliny's eulogy of Trajan and his denunciation of Domitian are alike couched in extravagant phrases, but the former perhaps rests more uniformly on a basis of truth and justice than the latter. The tone of the "Panegyric" certainly lends itself to the supposition of solve historians that Trajan was inordinately vain. That the emperor had an honest and soldierly satisfaction in his own well-doing is clear; but if he had had anything like the vanity of a Domitian, the senate, ever eager to outrun a ruler's taste for flattery, would never have kept within such moderate bounds. On the 25th of March in the year 101 Trajan left Rome for the Danube. Pretexts for a Dacian war were not difficult to find. Although there was no lack of hard fighting, victory in this war depended largely on the work of the engineer. The great military road connecting the posts in Upper Germany with those on the Danube, which had been begun by Tiberius, was now extended along the right bank of the river as far as the modern Orsova. The campaign of 101 was devoted mainly to road-making and fortification. In the following campaign, after desperate fighting to the north of the Danube in the mountainous region of Transylvania, Sarmizegethusa, the capital of Decebalus, was taken, and he was forced to terms. He agreed to raze all fortresses, to surrender all weapons, prisoners and Roman deserters, and to become a dependent prince under the suzerainty of Rome. Trajan came back to Italy with Dacian envoys, who in ancient style begged the senate to confirm the conditions granted by the commander in the field. The emperor now enjoyed his first Dacian triumph, and assumed the title of Dacicus. At the same time he royally entertained the people and no less royally rewarded his brave officers. But the Dacian chief could not school his high spirit to endure the conditions of the treaty, and Trajan soon found it necessary to prepare for another war. A massive stone bridge was built across the Danube, near the modern Turn Severin, by Apollodorus, the gifted architect who afterwards designed the forum of Trajan. In 105 began the new struggle, which on the side of Decebalus could now only lead to victory or to destruction. The Dacians fought their ground inch by inch, and their army as a whole may be said to have bled to death. The prince put an end to his own life. His kingdom became an imperial province; in it many colonies were founded and peopled by settlers drawn from different parts of the empire. The work done by Trajan in the Danubian regions left a lasting mark upon their history. The emperor returned to the capital in 106, laden with captured treasure. His triumph outdid in splendor all those that went before it. Games are said to have been held continuously for four months. Ten thousand gladiators are said to have perished in the arena, and eleven thousand beasts were killed in the contests. Congratulatory embassies came from all lands, even from India. The grand and enduring monument of the Dacian wars is the noble pillar which still stands on the site of Trajan's forum at Rome. The end of the Dacian wars was followed by seven years of peace. During part of that time Pliny was imperial legate in the provinces of Bithynia and Pontus, and in constant communication with Trajan. The correspondence is extant and gives us the means of observing the principles and tendencies of the emperor as a civil governor. The provinces (hitherto senatorial) were in considerable disorder, which Pliny was sent to cure. It is clear from the emperor's letters that in regard to nine out of ten of the matters which his anxious and deferential legate referred to him for his decision he would have been better pleased if the legate had decided them for himself. Trajan's notions of civil government were, like those of the Duke of Wellington, strongly tinged with military prepossessions. He regarded the provincial ruler as a kind of officer in command, who ought to be able to discipline his province for himself and only to appeal to the commander-in-chief in a difficult case. In advising Pliny about the different free communities in the provinces, Trajan showed the same regard for traditional rights and privileges which he had exhibited in face of the senate at Rome. At the same time, these letters bring home to us his conviction that, particularly in financial affairs, it was necessary that local self-government should be carried on under the vigilant supervision of imperial officers. The control which he began in this way to exercise, both in Italy and in the provinces, over the "municipia" and "liberae civitates", by means of agents entitled (then or later) "correctores civitatium liberarum", was carried continually farther and farther by his successors, and at last ended in the complete centralization of the government. On this account the reign of Trajan constitutes a turning-point in civil as in military history. In other directions, though we find many salutary civil measures, yet there were no far-reaching schemes of reform. Many details in the administration of the law, and particularly of the criminal law, were improved. To cure corruption in the senate the ballot was introduced at elections to magistracies. The finances of the state were economically managed, and taxpayers were most carefully guarded from oppression. Trajan never lacked money to expend on great works of public utility; as a builder, he may fairly be compared with Augustus. His forum and its numerous appendages were constructed on a magnificent scale. Many regions of italy and the provinces besides the city itself benefited by the care and munificence which the emperor bestowed on such public improvements. His attitude towards religion was, like that of Augustus, moderate and conservative. The famous letter to Pliny about the Christians is, according to Roman ideas, merciful and considerate. It was impossible, however, for a Roman magistrate of the time to rid himself of the idea that all forms of religion must do homage to the civil power. Hence the conflict which made Trajan appear in the eyes of Christians like Tertullian the most infamous of monsters. On the whole, Trajan's civil administration was sound, careful and sensible, rather than brilliant. Late in 113 Trajan left Italy to make war in the East. The never-ending Parthian problem confronted him, and with it were more or less connected a number of minor difficulties. Already by 106 the position of Rome in the East had been materially improved by the peaceful annexation of districts bordering on the province of Syria. The region of Damascus, hitherto a dependency, and the last remaining fragment of the Jewish kingdom, were incorporated with Syria; Bostra and Petra were permanently occupied, and a great portion of the Nabataean kingdom was organized as the Roman province of Arabia. Rome thus obtained mastery of the most important positions lying on the great trade routes between East and West. These changes could not but affect the relations of the Roman with the Parthian Empire, and the affairs of Armenia became in 114 the occasion of a war. Trajan's campaigns in the East ended in complete though brilliant failure. In the retreat from Ctesiphon (117) the old emperor tasted for almost the first time the bitterness of defeat in the field. He attacked the desert city of Hatra, westward of the Tigris, whose importance is still attested by grand ruins. The want of water made it impossible to maintain a large force near the city, and the brave Arabs routed the Roman cavalry. Trajan, who narrowly escaped being killed, was forced to withdraw. A more alarming difficulty lay before him. Taking advantage of the absence of the emperor in the Far East, and possibly by an understanding with the leaders of the rising in Armenia and the annexed portions of Parthia, the Jews all over the East had taken up arms at the same moment and at a given signal. The massacres they committed were portentous. In Cyprus 240,000 men are said to have been put to death, and at Cyrene 220,000. At Alexandria, on the other hand, many Jews were killed. The Romans punished massacre by massacre, and the complete suppression of the insurrection was long delayed, but the Jews made no great stand against disciplined troops. 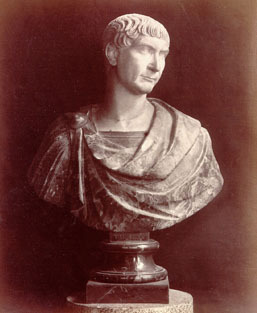 Trajan still thought of returning to Mesopotamia and of avenging his defeat at Hatra, but he was stricken with sickness and compelled to take ship for Italy. His illness increasing, he landed in Cilicia, and died at Selinus early in August 117. Trajan, who had no children, had continually delayed to settle the succession to the throne, though Pliny in the "Panegyric" had pointedly drawn his attention to the matter, and it must have caused the senate much anxiety. Whether Hadrian, the relative of Trajan (cousin's son), was actually adopted by him or not, is impossible to determine; certainly Hadrian had not been advanced to any great honors by Trajan. Even his military service had not been distinguished. Plotina asserted the adoption, and it was readily and most fortunately accepted, if not believed, as a fact. The senate had decreed to Trajan as many triumphs as he chose to celebrate. For the first time a dead general triumphed. When Trajan was deified, he appropriately retained, alone among the emperors, a title he had won for himself in the field, that of "Parthicus." He was a patient organizer of victory rather than a strategic genius. He laboriously perfected the military machine, which when once set in motion went on to victory. Much of the work he did was great and enduring, but the last year of his life forbade the Romans to attribute to him that felicitas which they regarded as an inborn quality of the highest generals. Each succeeding emperor was saluted with the wish that he might be "better than Trajan and more fortunate than Augustus." Yet the breach made in Trajan's felicitas by the failure in the East was no greater than that made in the felicitas of Augustus by his retirement from the right bank of the Rhine. The question whether Trajan's Oriental policy was wise is answered emphatically by Mommsen in the affirmative. It was certainly wise if the means existed which were necessary to carry it out and sustain it. But succeeding history proved that those means did not exist. The assertion of Mommsen that the Tigris was a more defensible frontier than the desert line which separated the Parthian from the Roman Empire can hardly be accepted. The change would certainly have created a demand for more legions, which the resources of the Romans were not sufficient to meet without danger to their possessions on other frontiers. The records of Trajan's reign are miserably deficient. Our best authority is the 68th book of Dio Cassius; then comes the "Panegyric" of Pliny, with his correspondence. The facts to be gathered from other ancient writers are scattered and scanty. Fortunately the inscriptions of the time are abundant and important.